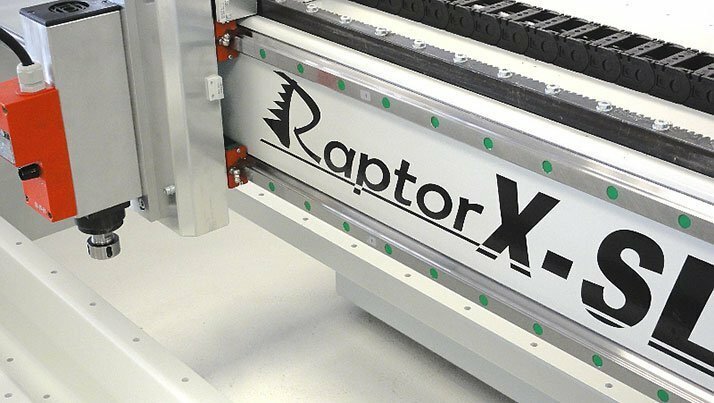 The application range of the RaptorX- SL CNC milling machine is extremely wide due to the adjustable work surface height (variable bridge clearance: 150mm, 300mm or 400mm) plus the travel range of the Z axis of 300mm (at no extra cost). The Z axis stability is excellent, allowing you to work as accurately on large 3D objects as one can on flat sheet materials. Use the system as a plasma cutting system or a water jet cutting system, appropriate accessories are available. 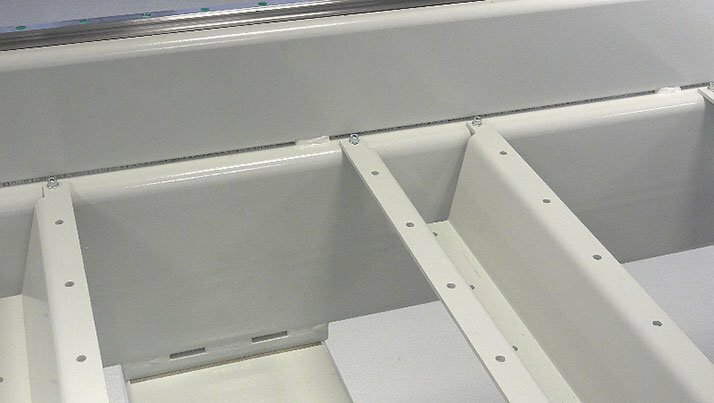 It is possible to work on work-pieces up to a height of 850mm (steel cabinets etc.) or three-dimensional objects up to a height of approx. 400mm (with 400m long milling cutter). This capability is unusual for machines of this size and mold makers usually use a layered construction method to produce large 3D objects. Considering our new concept of working with an “invisible” motor for the X-axis and the proven high performance of the entire machine, we will not have to wait long for imitators in the industry to try copy this design. Find several other videos of examples being milled in marble, wood, Styrofoam, aluminium etc. here. 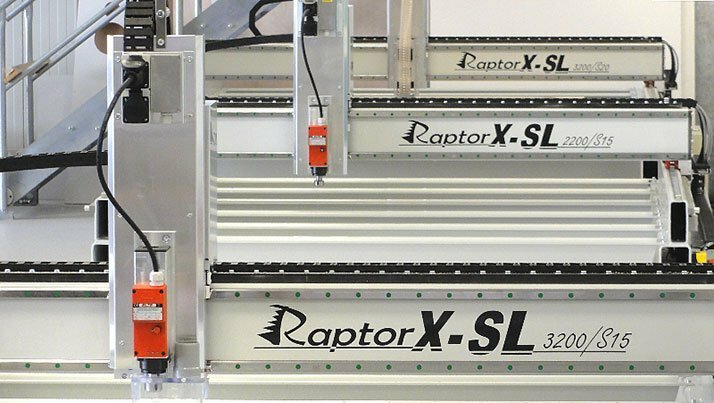 The new large gantry cnc router RaptorX SL series (Milling, Plasma cutting, Water jet cutting machine, tangential knife cutter etc.) ! Sold around 100 times within the last 3 years ! Up to 12.000 x 3000 mm available and also as Plasma Cutter ! Steel construction of extremely high tortional stability of mainly hot-formed steel profiles with a plate thickness up to 6,3mm ! 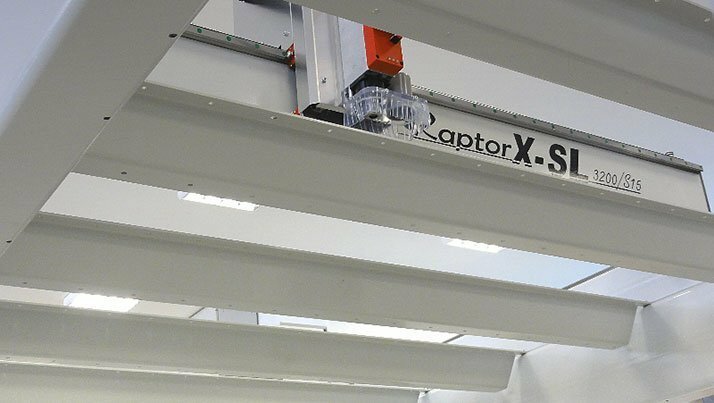 Highest stability: At a bridge load of 100kg in the middle of the Y axis the bridge of a 2m wide RaptorX-milling machine (travel Y 2010mm) “bends” only 0,02mm, which is only two hundredth of a mm !Therefore even spindles up to approx. 70kg or other heavy tools or tool heads can be used without loss of accuracy of the system ! Variable work space because of adjustable table support struts (optional, price per piece 195 Euro, supports up to approx. 200 kg per strut). Clearance under bridge 150mm, 300mm or 400mm selectable. 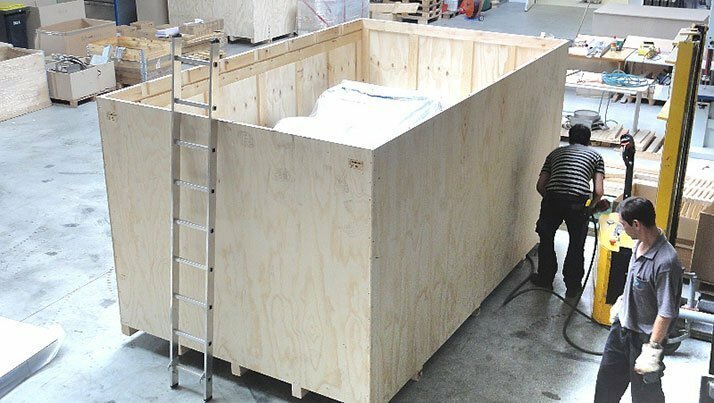 The framework is open towards the bottom which allows working with tall work pieces (control cabinets, door- and window frames, large three-dimensional parts). New drive concept with planetary gears. This allows traversing speeds up to 40 metres (X + Y axis) per minute (in combination with Mach3, Win PCNC Profi and USB). High speed with maximum performance: three-dimensional drives with Mach3 software up to approx. 10 meters per minute (approx. 170mm per second), depending on contour shape. 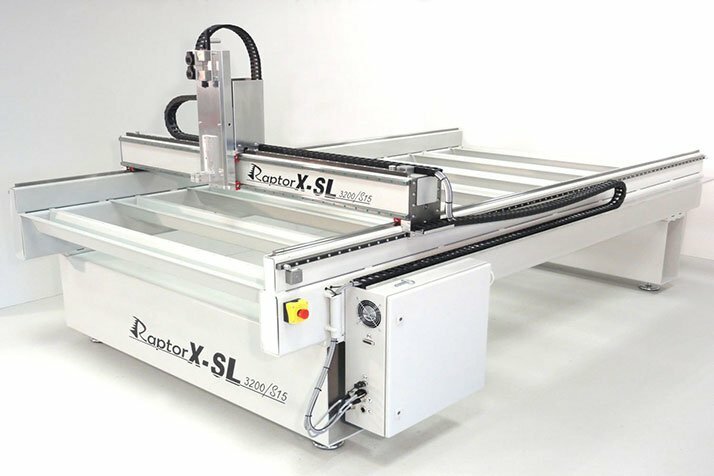 Therefore the RaptorX-SL almost reaches the performance of a otherwise much more expensive Servo-CNC milling machine ! Unbeatable price-performance ratio! See for yourself! Demonstrations daily by arrangement! Finaly an end to flimsy steel machines constructed of cold drawn, paper thin square tubing which is prone to distortion when welded together. Manufactured from high quality heat-treated steel, the frame construction and 9.4 Amp Brushless drive motors that produce over 900 Ncm holding torque, provide very reliable and stable platforms that are unbeatable in their price to performance ratio. Traverse speeds of up to 40 meters per minute can be achieved. This demonstrates the high quality and performance of our machines. From us you will purchase carefully thought-out technology with the necessary motor control unit as well as high-quality software included in the package price. For the present, the standard machines will be available in six different travel sizes from 1200 x 1510 x 300mm up to 3200 x 2010 x 600mm. Customized machines with double Z axis etc. can be made up to a travel size of 17.500 x 3010mm !! 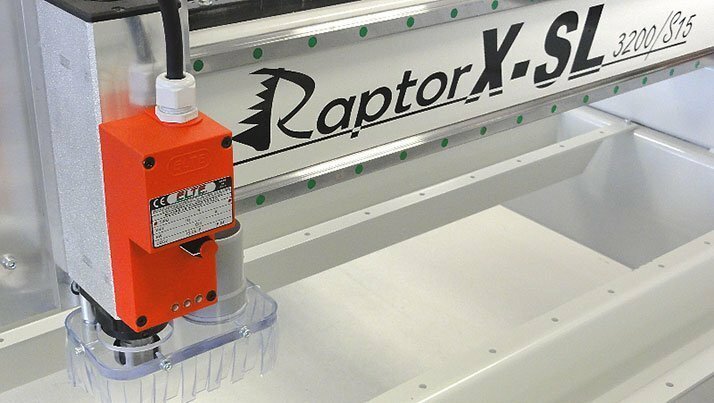 Here you can find applications with videos, photos and reports of the RaptorX-3D-CNC milling machine. To achieve maximum stability and to be able to work with granite, marble or aluminum, select the correct height table to ensure the travel to the material surface is as small as possible for best accuracy. Drive X / Y / Z Stepper motor 9,4 Ampere / 930 Ncm holding torque! Total weight approx. 900 kg incl. 3-channel controller. 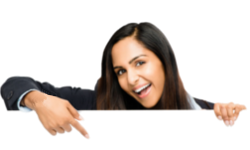 Telephonic and TeamViewer-online-support for an unlimited period!